The NYT picked John McCain and Hillary Clinton as Primary Choices. There should no contest for McCain, who stood against Bush, against torture, for democracy. And yes, Mitt Romney keeps compromizing on any issue in order to get one more vote (he even joined the crew of "Roe vs Wade" killers). No one know what that guy would do. But John McCain sold his soul to the Discovery Institute and stood in favor of teaching Intelligent Design theories in school. And that's a rather scary perspective. Unless someone comes out of the blue (Bloom ? ), the only way out for the US is to elect a Democrat for the top job. NYT Executive Editor Bill Keller can trust Hillary's judgement : not only did he support the war in Iraq but he preferred Paul Wolfowitz to Colin Powell. By the way : Wolfie is back to the White House. Is Keller also betting on a war with Iran ? 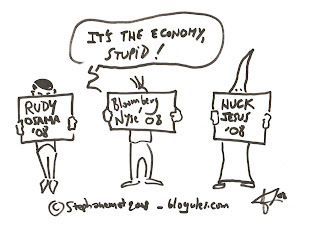 Bloomberg : it's the economy, stupid ! Billy the Comeback Kid is shooting on sight. He wants Barack Obama down one way or another to save Hillary and himself from humiliation. But shooting at a MLK-RFK wannabe 40 years after the double murder of Martin Luther King and Bobby Kennedy doesn't sound like a smart move. "Billary" could win South Carolina and sweep Florida clean, but what would they get at the end of the day ? A ticket for the 2008 Superbowl for sure, but also big trouble within the Democratic party... not to mention yet another competitor from NY state (Mike Bloomberg). America wants decency. America wants to get rid of win-ugly-presidents. America needs Obama. I warned Republican voters four years ago* : if Bush wins these elections, your party loses. The divide seems everyday more obvious now, but the main decision remains to be taken : to separate US politics from religion. As expected**, all 2008 candidates are compelled to prove how strong their belief is, and this sick competition turns into a caricature : Romney, faithful to his Mormon religion as well as to his wife, is criticized by a womanizer (Giuliani) and two more or less outspoken promoters of Intelligent Design (Huckabee and McCain - the latter even gave conferences at the infamous Liberty University and Discovery Institute***). It sounds almost normal to most Americans but this is not a political debate - at least not in a country supposed to be a model democracy. It is time to make things clear to the audience at the National as well as at the International levels and to officialize the creation of The Theocratic Party. All candidates would then decide : do they put democracy and the republic first, or they believe politics should be ruled by religion ? True democrats and true republicans will chose not to mix religion with politics. Those who want America to turn into a theocracy and away from its core values must be clear about it. They can keep competing on theological issues, but never more in the name of a Republican or a Democratic Party. "I look forward to your response." "Have enhanced techniques been authorized and approved by the President ?" To this question, and many other relevant ones regarding interrogation techniques used by the Agency, Scott W. Muller, CIA's general counsel, lyrically answered "I think it would be fair to assume that policy as well as legal matters have been addressed within the Executive Branch." Rep. Jane Harman (D-CA), top Dem in the House Intelligence Committee, received no feed back regarding the most crucial issue of the destruction of the infamous videotapes either*. Her recommandation was pretty clear, though : "You discussed the fact that there is videotape of Abu Zubaydah following his capture that will be destroyed after the Inspector General finishes his inquiry. I would urge the Agency to reconsider that plan. Even if the videotape does not constitute an official record that must be preserved under the law, the videotape would be the best proof that the written record is accurate, if such record is called into question in the future. The fact of destruction would reflect badly on the Agency." Praise Jane Harman for restoring the image of the Democrats and beyond, the whole American people, in front of History. Let's forget about Muller and even Gonzales. The President must answer by himself. In front of an Impeachment Commitee.